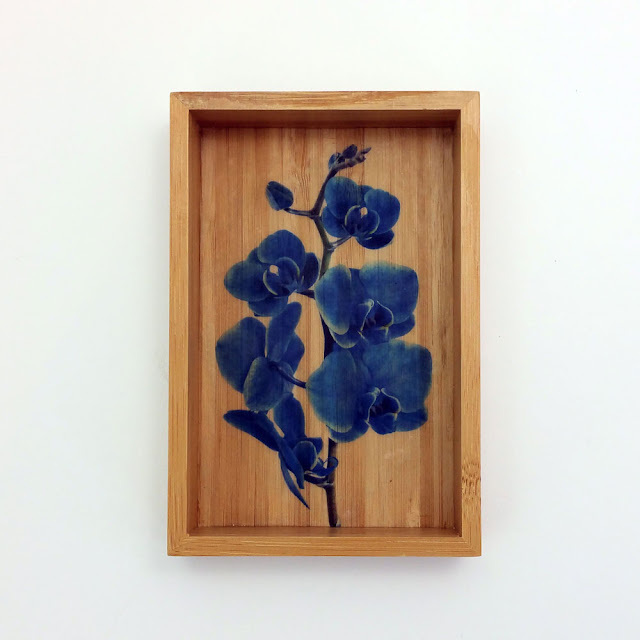 Here they are: detailed instructions on how to use Dekoversum Rice Papier on lacquered wood. As decoupage motive, I a chose a great, deep blue Phalaenopsis Orchid. You can find the story behind that decoupage paper design here. Personally, I love beautifully grained, light wood and for this project I don't want to cover the wood grain completely. 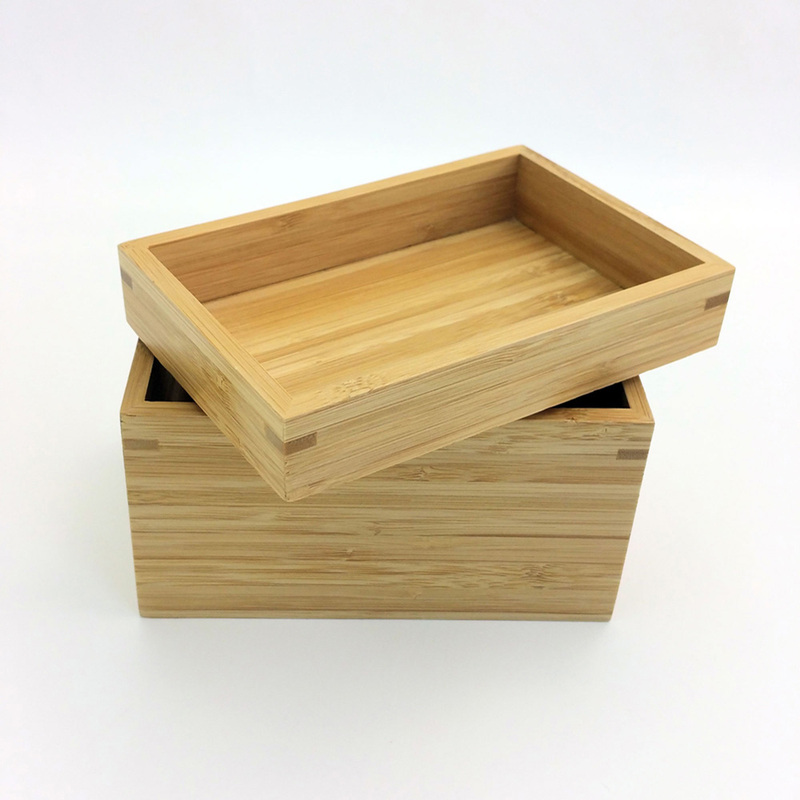 So I picked out a box made of light bamboo wood. 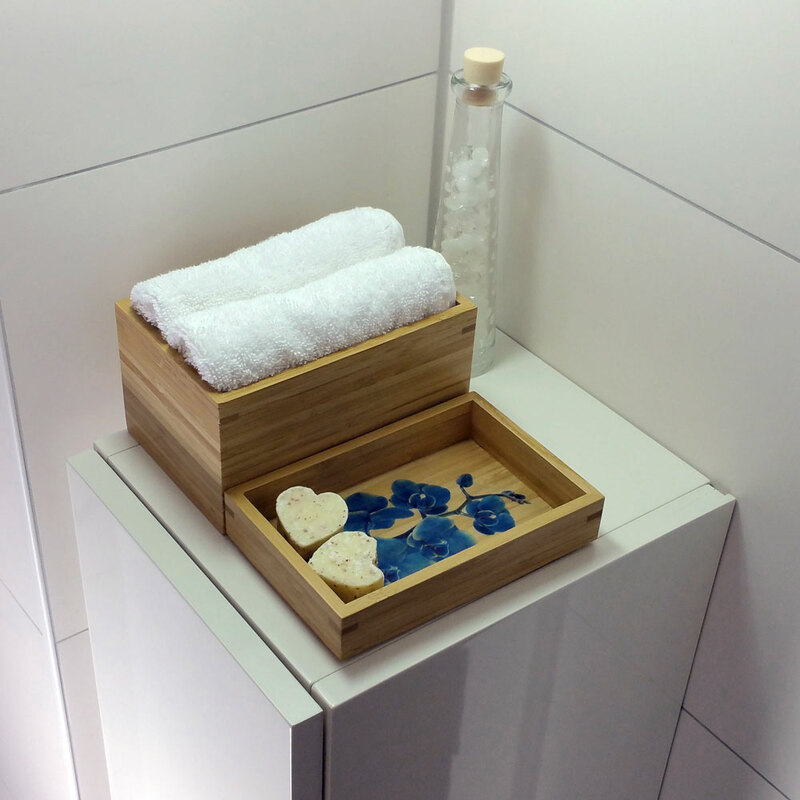 The box is part of the IKEA Dragan Collection, a series of bathroom boxes and utilities. The bamboo wood is light and already lacquered so there is no need to prime it. 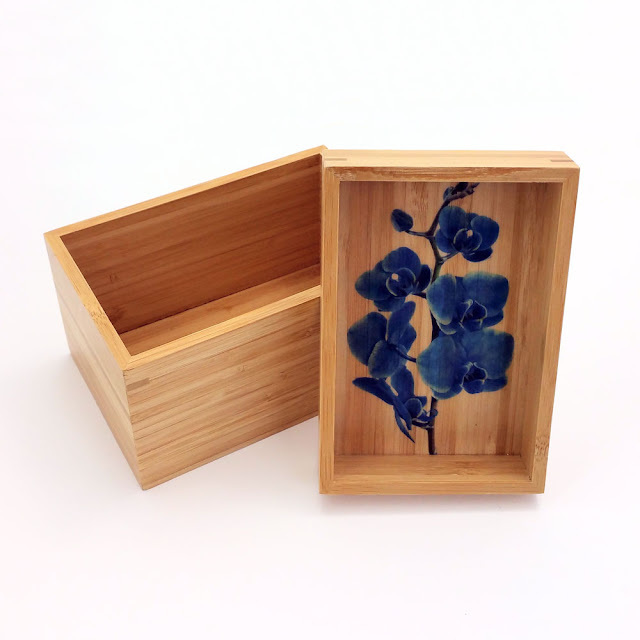 In order to decorate the wodden bamboo box you need paper – of course. Besides, you need a pair of scissors, decoupage glue and a soft flat brush – not to small, size 14 or 16. 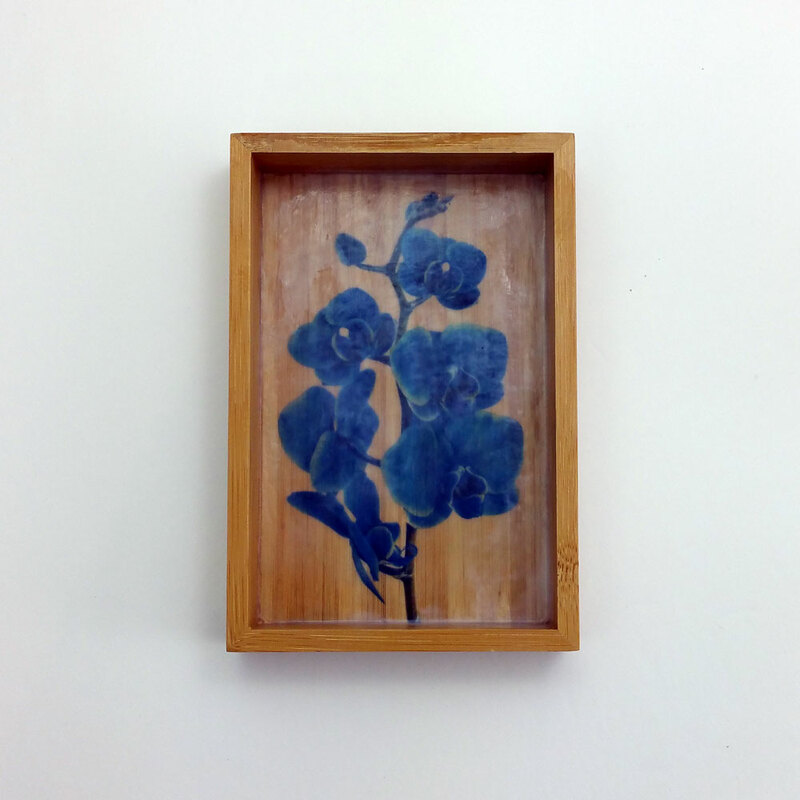 If you would like to create a smooth decoupage finish, you additionally need a piece of wet sand paper (800 grain). 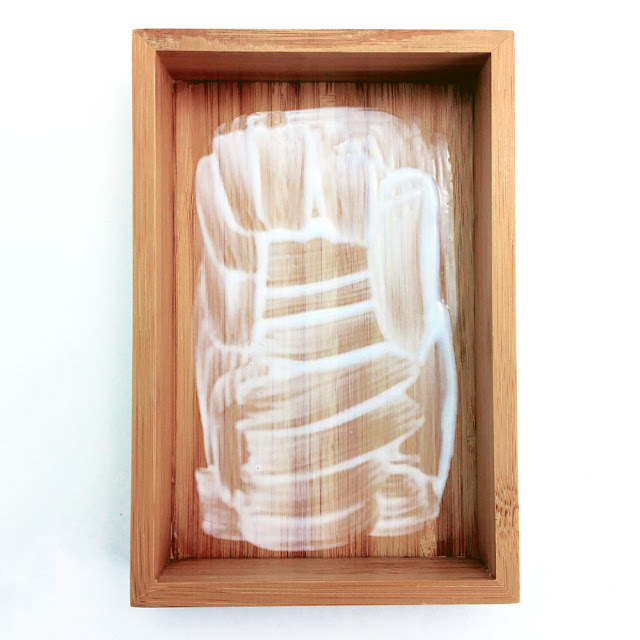 If you plan to use the decorated box a lot, you may also need a clear water based varnish for protection. Dekoversum Rice Paper is - as you will notice - very thin. It is important to distinguish between the front and the back of the page. The more shiny side is the front page. A little hint: If you are not sure whether it is the front, search for the Dekoversum Logo on the paper. Can you read the word "Dekoversum"? Then this is the front page. Why is the difference between front and back so important? 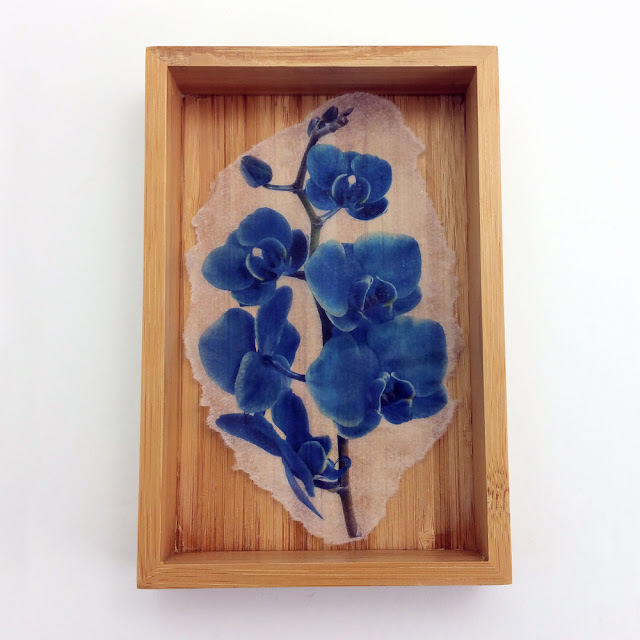 Rice paper is supposed to turn completely transparent when you use it with decoupage glue. 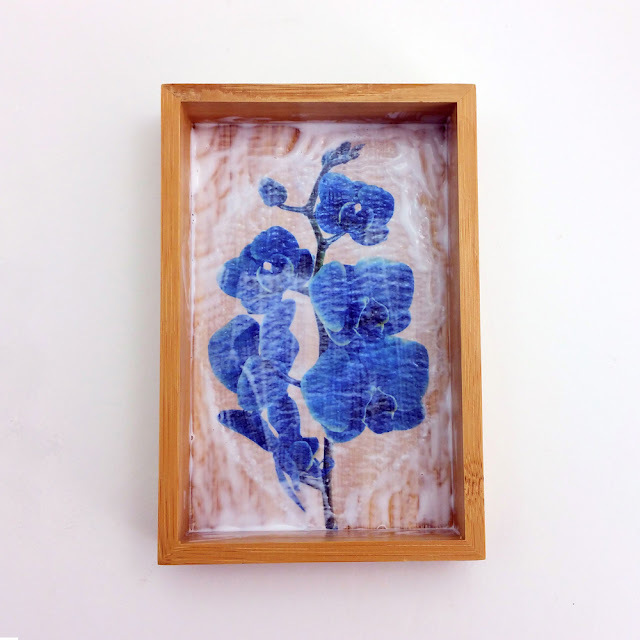 However, in order to turn transparent it has to thoroughly soak up decoupage glue. The shiny front of the Dekoversum Rice Paper does not soak up the glue as thoroughly as the back. Therefore, when you glue the paper upside down, there may be some white spots on the paper that did not soak up enough glue and did not turn transparent. On some surfaces, especially round ones, it may me necessary to tear the paper into smaller pieces and to puzzle them back together afterwards in order to create a wrinkle-free result. 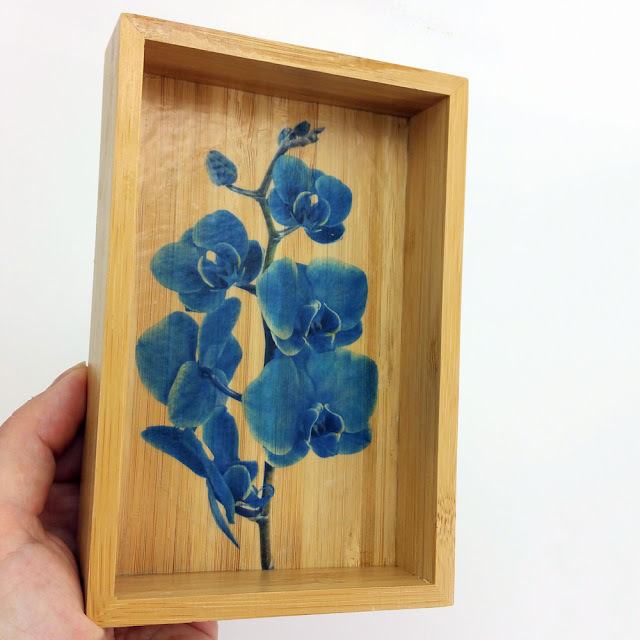 Here with this project, the surface is flat and even, so I decided to keep the decoupage motive - the blue orchid - in one piece. In order to achieve a seamless result, it is best to tear the rice paper. Cut edges stay more visible. 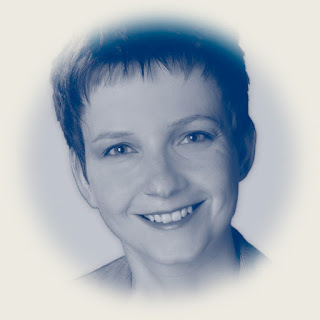 This is how I do it: I cut out the picture roughly with scissors first and then I carefully pluck the paper on the edges with my finger nails. This way I achieve a nice torn edge without the danger of ruining my picture. First put glue on the surface. 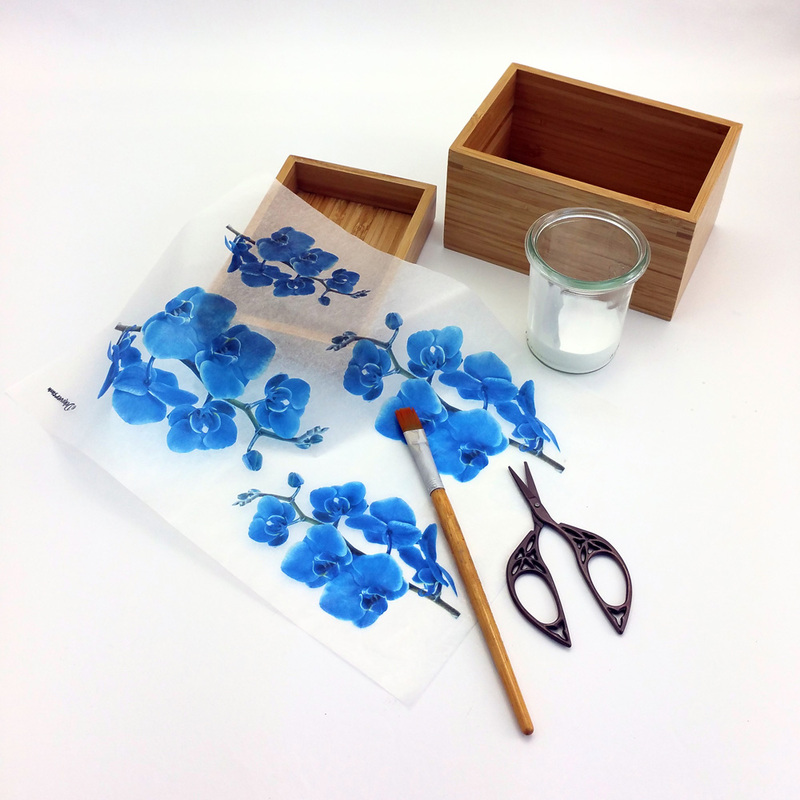 Use glue generously, so the rice paper can soak up the glue and turn completely transparent. Then place the paper on the glue and glue the paper to the surface. Use a soft flat brush. Work from the center outwards and try to smooth out any wrinkles, air bubbles and any excess glue. In case it didn't work at first try, you may – carefully – lift the paper up again and try it again. However, you shoudn't do that too often. Eventually the paper will be so soaked with glue that it tears easily. A little note: If you have worked with napkins before, you will notice that the Dekoversum Rice Paper is more durable than the thin top layer of a napkin. You can see on the picture that the rice paper soakes up the glue from up and below and turns white. This is how it is supposed to be. Then the decoupage glue starts to dry. During that process the glue turns transparent. 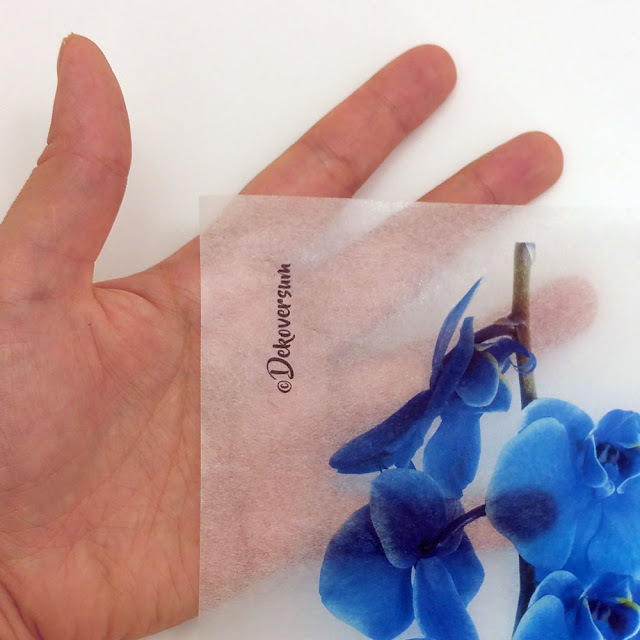 At the same time the rice paper sticks to the surface and turns transparent as well. The necessary dry time depends on what type of glue you use. The glue is completely dry, when it is completely transparent and there are no more damp spots. Personally, I like the result already. However, if you have a very close look, you still see some glue irregularities on the surface. If you want to achieve a real smooth decoupage result there are a few more steps necessary. 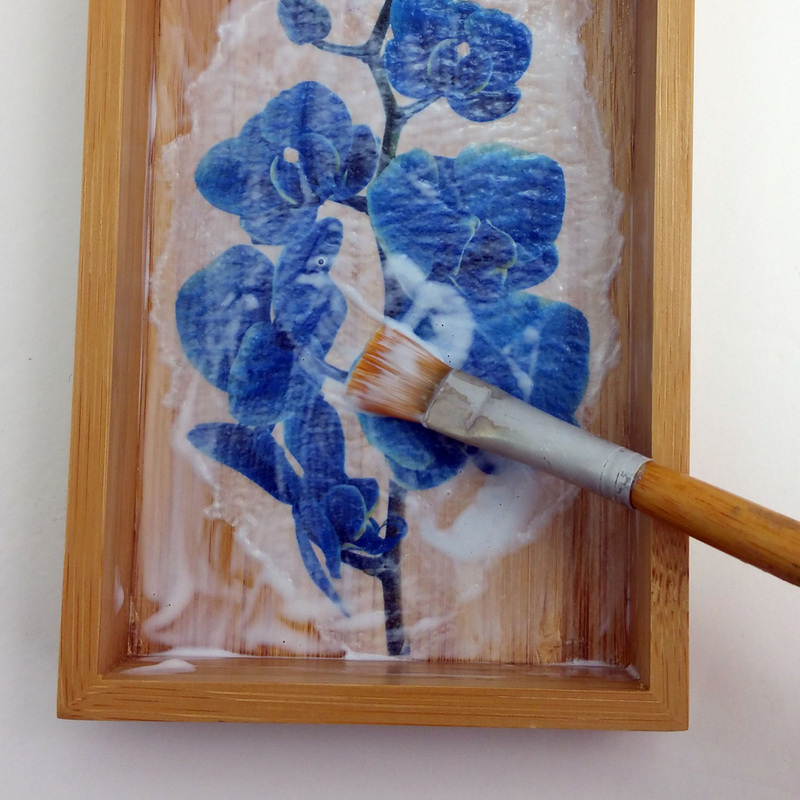 For a smooth finish you need to build up a few additional layers of decoupage glue. How many depends on the glue you use. I usually put on 5 additional layers. Between each layer, the glue should dry about 10 to 15 minutes. After you have built up some layers of glue, you can start to wet sand the surface. I usually use a wet sand paper with a 800 grain. While wet sanding, the glue turns a bit white again, that's fine. By the way: You can reuse the piece of wet sand paper multiple times: just let it dry and use it again. After you are finished wet sanding, everything has to dry again. Then you may – but you don't have to – put on a layer of varnish. Personally, I'm usually too lazy to do that :-) Since I use a decoupage glue that is both glue and varnish, the additional layers of decoupage glue are enough protection. However, there are some glues out there on the market that still feel sticky, even after drying over night. When you use that type of glue, an additional clear and non-sticking varnish is necessary. In case you have an object that is very frequently used, you might want to put on varnish for protection. What you can see very well, that the rice paper turned completely transparent. 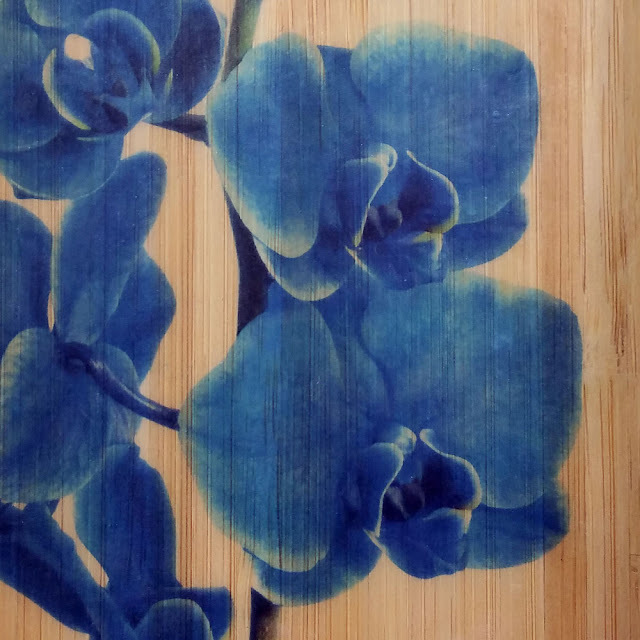 The beautiful bamboo woodgrain is still visible and you can see all of the orchid details as well. 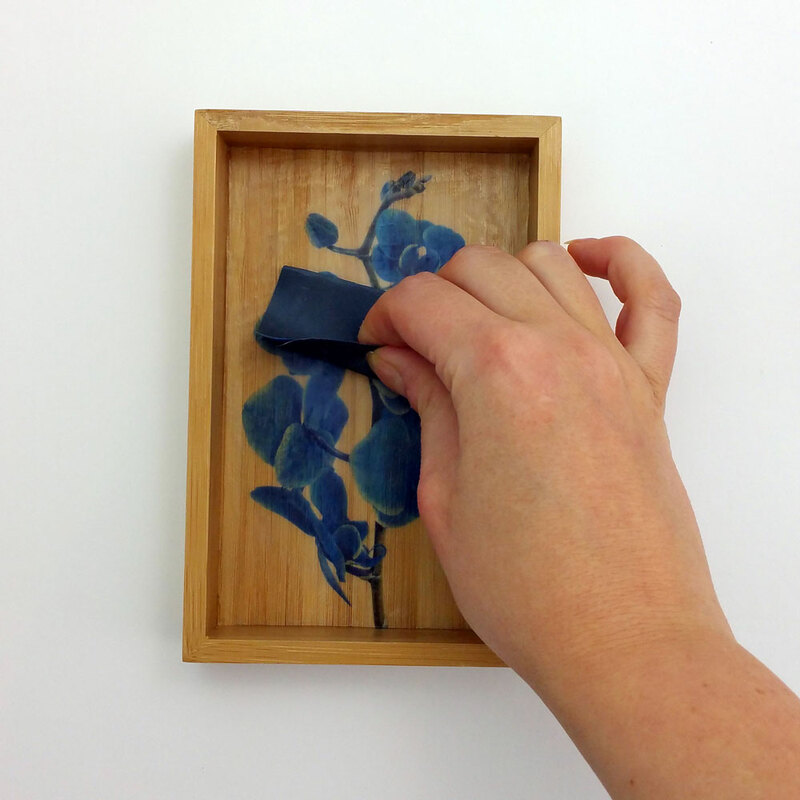 A great picture-perfect decoupage effect!